Fran's House of Ayurveda: RECIPE ~ Tabbouleh Tabbouli Tabuli! RECIPE ~ Tabbouleh Tabbouli Tabuli! 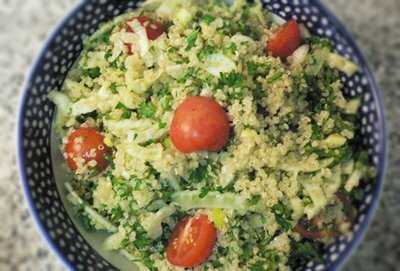 Whichever way you want to spell it, this tabouli is a bit different from your typical cracked wheat parsley salad. This one uses quinoa instead of bulgur, and adds cherry tomatoes and sliced fennel bulbs for a really delightful twist! If you're like me and have never eaten fennel bulb, this will make you love it. Wash the quinoa thoroughly until water runs clear. Place in a small pot with 1 1/2 cups water. Bring to a boil, cover, and simmer over medium heat for 10 to 15 minutes until all water is absorbed. Transfer to a large bowl and fluff with a fork. Let cool. Cut fennel bulb in half, then halve each half, and slice as thinly as possible. Chop green onions and parsley. When the quinoa is cooled, stir in the fennel, parsley, tomatoes, lemon juice and rind, and olive oil. Season with salt and pepper. Adjust any flavours (more lemon juice? more pepper?) and transfer to a pretty serving bowl. Here's an idea -- serve with some samosas or spinach pies that you bought, and make some fresh hummus to serve on the side with pita! Tabouli salad serves 4. ~ Sprinke with pine nuts (toasted or raw) for a delicious garnish (good for Vatas and Pittas). ~ Add 1/4 cup crushed kalamata olives. ~ Replace half the parsley with fresh chopped mint (great for Pittas). ~ Add a clove or two of minced garlic or a sprinkle of cayenne for a kick (not great for Pittas!). ~ Give it a latino flair by substituting the parsley with cilantro, add half a cup of corn kernels and a diced avocado! perfect for a summer afternoon. next time i will definitely try half mint/half parsley.